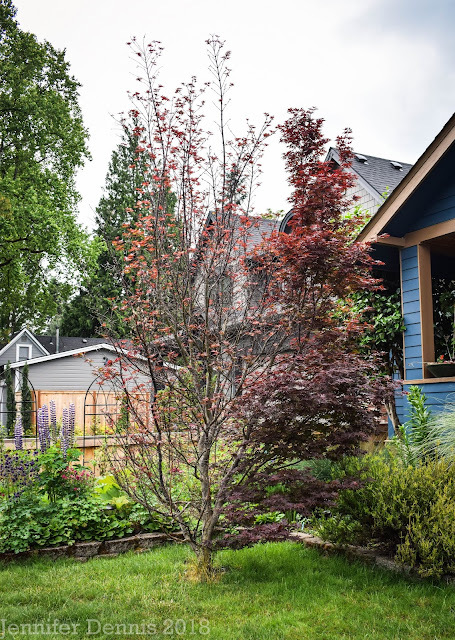 The stars seemed to be aligned against me to get my garden built and planted this spring at the old house we are remodeling / planning to move to in July. I played second fiddle to what felt like all the other party's time-frames. Jenni wasn't a happy gardener. 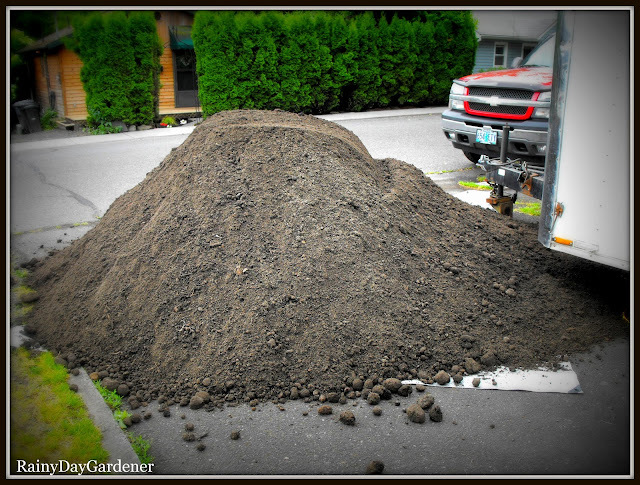 I ordered five yards of dirt to be delivered early last Saturday morning and hopped in my truck to make the hour and a half drive south to West Linn to meet the delivery man bright and early at 9am. Wake up sleepy neighborhood! I admit that fat, pile of dirt felt like I was looking at Mt. Everest. Before I started, I went to the back of the yard where my garden boxes are (200 ft 1 way) and put newspaper down inside the beds to create a bit of a layer between the dirt and overgrown weeds. Then I began a long day of digging and hauling dirt to the back of the property. It was good, honest work. The humidity, however, was heavy and thick. Quite unusual for our neck of the woods. Apparently there were quite a few heavy showers throughout the metro area that day. I lucked out with no rain to make my tasks any more difficult. On Sunday, I came back with the family and worked on tidying the yard and getting my vegetables tucked in their beds. While the tomatoes I started from seed are um, still tiny...I did get my hands on some organically grown tomatoes and peppers in size- extra large. My starts of heirloom squash (Thank you Diana! ), pumpkins and zucchini (because I need more frozen zucchini in my freezer) were ready to be transplanted. I sowed swiss chard, carrots, summer spinach and lettuce directly. I did not put beans in this year as it just felt too late. Next year. Fast forward another month and I'll be doing this adventure again when I build my winter garden raised beds. I ordered seeds this week and will start them indoors. I'm dreaming of homegrown kale for my juicer! It's always the setting up shop that is hard to do, but when the results are in, the feeling is priceless. My goodness, that was a lot of work you put in! It looks really good, the beds are so neat. Can't you plant bush beans? There is plenty of time for them to bear, they probably only take about 50 days from seed. I'll bet you slept good after all that work! 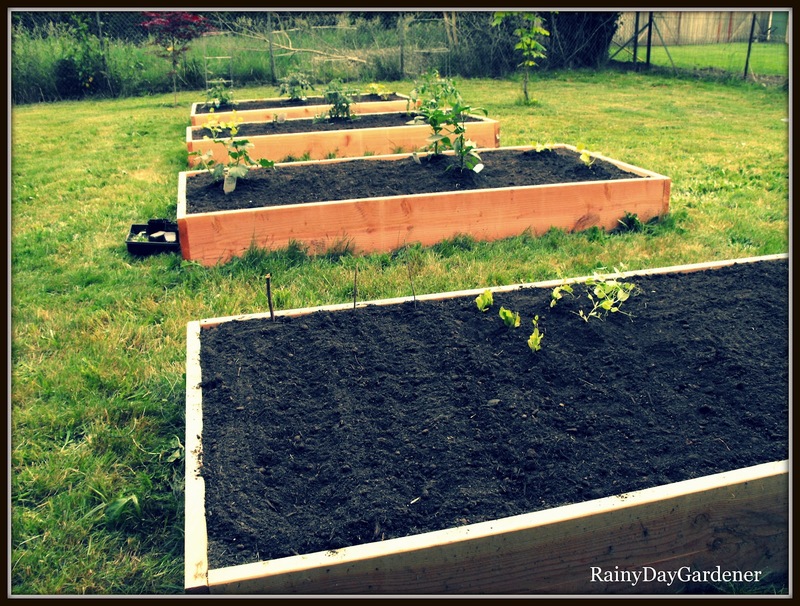 Your raised beds look great! Oh girl, I sure did sleep good! And I've been sore all week to boot..lol! It will be so worth it when you get your first crop. I am so happy for you! I love the beds. You made them nice and deep. I am glad the weather worked with you. I can't wait to see how they grow. I want to learn more about what you plant in your winter garden. Love the photos. That must be a huge lot. Hi Bonnie, the lot is 200 ft deep, so I have a lot of room to garden in the city. It's a wonderful feeling! I thought I had crazy energy! I wish I had all of yours ;) It looks really nice and when you work that hard to get it nice, it seems like everything looks and tastes better! Hey IG, I had this fleeting thought as I tromped back and forth across that yard that if I did this sort of work weekly, I'd get really buff. By the end of the day I was ok with not being so buff. What gorgeous beds! Shoveling and hauling soil is no fun, but it's always worth it in the end!!! I hope your beds and new veggies give you many bountiful harvests!!! That was a job well done! It's looking mighty good now. Thanks Bernie! Let's hope everything manages without me hovering daily until we move in. Good job the rain held off - shovelling mud would have been even less fun! I too was going to say that I would still plant French and runner beans - nothing to lose if they don't grow but we sow French beans at different times and seem to manage a crop. Hi Sue, I'm pretty sure I have some seeds of bush beans from last year still hanging around. I'll be going to work on the house this weekend and will see where I can squeeze some in. That's a lot of work...so worth every drop of sweat though. Our humidity is always high here, air you can wear is what we call it. So I know how much harder is was to move this mountain. 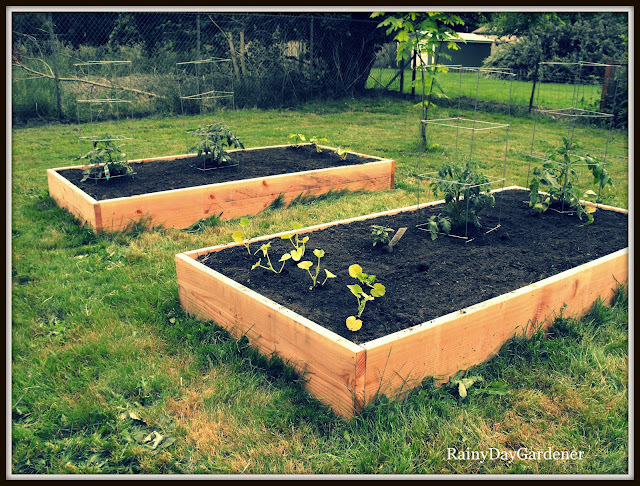 Your raised beds look great. A nice harvest is in your future. 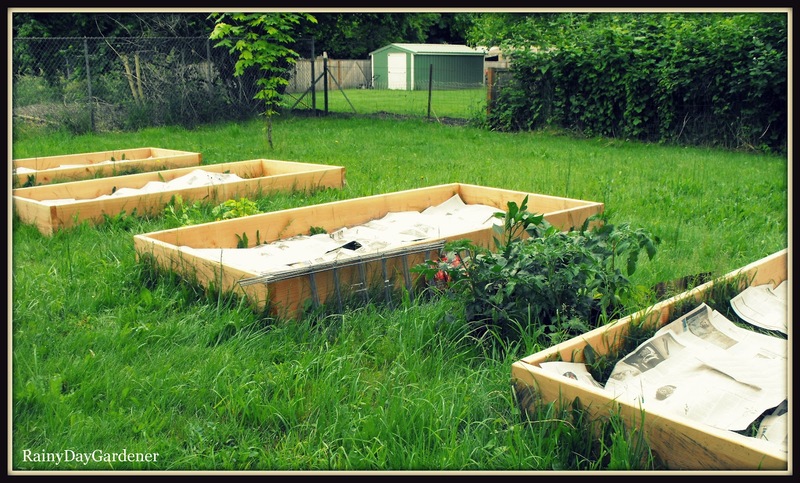 Those raised beds look VERY substantial! If they were mine though, I'd reinforce the corners with some metal angle-brackets. Just realised that I was not oficially one of your Followers - but I have now rectified that! Very nice garden! Most of our stuff is still in the greenhouse, although all the seeds are planted. Congrats on getting your veg beds filled and planted up. How exciting! Hope your seeds come up nicely and you have a good first harvest. P.S. don't forget to protect from slugs and snails - I find them in my veg box! Thanks Kelli for the reminder, I think I'll set up some beer traps this weekend!